Should You Buy a House with Knob and Tube Wiring? Homes in the U.S. built from around 1880 to the 1950s often still have knob and tube electrical wiring. 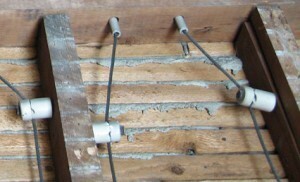 This is where electrical wires anchored by ceramic insulating knobs pass through ceramic tubes placed inside holes drilled into the wooden joists of the house. Many home buyers ask us what their options are if they want to buy a house with knob and tube wiring. It’s important for home buyers to understand that knob and tube wiring itself is not unsafe. In fact, the necessary drilling, soldering, wrapping, and splicing during the original installation required great deal of skill, since the wiring was meant to last. However, the general rule of thumb is that it needs to be replaced in 60 days to obtain home insurance. No home insurance, no mortgage. Obtaining insurance for a home with knob and tube wiring comes with a specific set of requirements. You must hire an electrician and submit to your insurance agent a contract stating that the knob and tube wiring will be replaced within 60 days. Once the job is complete, a receipt indicating completion must be submitted. If home buyers can’t take it out, or are unable to do it within a certain time frame, or if it is active, they can still get insurance through the Massachusetts Property Insurance Underwriting Association (MPIUA). The MPIUA provides basic property insurance on eligible property for applicants who have been unable to gain insurance through the voluntary market. Keep in mind rates for MPIUA tend to be higher (between 30-60%) than a standard insurance company in Massachusetts. They will come out and do an inspection prior to coverage, but the inspection is free of charge. The Department of Housing and Urban Development (HUD) states that home appraisers should examine the electrical box to ensure there are no broken or frayed wires. Major selling guides (Fannie Mae, Freddie Mac & FHA) are ok with knob and tube wiring as long as it functions, is safe, in good condition and is a minimum of 60 amps. When you are buying a home with knob and tube wiring, there are a few issues to be aware of. 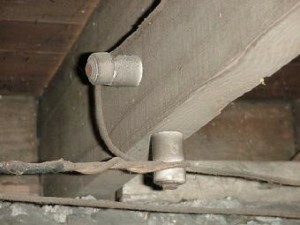 For instance, insulation cannot touch the wires, as the heat from the wires cannot dissipate. Knob and tube wiring does not provide a third wire for grounding, only a hot wire and a neutral white wire. Even if two-slot outlets are replaced with three prong outlets (for devices that require them, such as kitchen appliances) there is still no third wire which protects against electric shock. One of the most common issues with knob and tube wiring is with incorrect modifications. Because it is easily accessible, some homeowners make their own repairs and do not splice the wire correctly and they make inadequate, unsafe modifications. Knob and tube wiring is no longer used in homes because it doesn’t carry the same capacity for electricity that modern homes require. Modern households use much higher loads of electricity than the wiring was originally designed for- the standard is now 60 amps. Homeowners should not install higher amp fuses to match the increase in electricity use as this will cause the wires to overheat. Knob and tube wiring, when not properly maintained, yields an increased risk in shock or fires. Only qualified, licensed electricians should inspect and replace the wiring in your home. The wiring can be found in your attic, beneath the floor boards in the basement and inside the walls of the home. It’s also detectable in the circuit box, but even with the power off, the wires can be live and potentially fatal to the touch. Once a professional is able to inspect the wiring, they’ll devise a plan and quote to bring your electrical up to code. The original wiring does not need to be removed. To do so involves additional time and money without any real benefit; it won’t be connected to a power source once the new wiring is installed and will therefore no longer pose a threat. This can be an expensive process, but will save overall in potential hazards as well has higher home insurance premiums through the MPIUA. If the home you want to make an offer on has knob and tube wiring, have a licensed electrician inspect it thoroughly to determine the cost to bring it up to code. If the wiring is a hazard, you have a few options. You can buy it as is and deal with it when you own it. In doing that you can attempt to offer less in preparation for having to deal with the expense. But this will only work if you are not competing with other buyers. Your other option is to request that the seller remove it as part of your offer. As a seller, you can have it removed yourself to avoid any issues with potential buyers or you can leave it in place and sell as is. Be aware, though, that buyers, agents, and home inspectors will likely notice it.